As an employer, you'd rather think about hiring than firing, but sometimes employment terminations are a necessary part of business. Create an Employee Termination Letter to explain why you're ending an individual's employment, and outline other details about the termination. The Termination Letter is your written record to help protect you if any questions or legal issues arise regarding the termination. You're an employer who needs to terminate an employee because of layoffs, poor performance or some other reason. Your company is terminating an employee, and would like to have a record of the termination in the event of a lawsuit. Letting go of an employee can be a relief, or in the case of a forced layoff, it can be very difficult. But being a professional means putting the notice of employment termination in writing. Let the employee know why the decision's being made and what both of your responsibilities are. Basic information: Note who is being terminated, the name of the company, and the name of the person who is handling the cessation of work. You'll also want to include the date, both of the letter of separation and the date the termination becomes effective, if those dates are different. Reason for employee termination: As noted above, sometimes, a termination is out of your control. You may be an HR manager, forced to lay off an otherwise productive employee because the business is going through a rough patch. On the other hand, you might be firing an employee for verbal abuse, excessive tardiness, or poor performance. With a Termination Letter, your employee will get a better understanding of why they're being let go. Lead up: If you are terminating an employee for reasons under their control, make sure to note whether they were warned, how many times, and whether those warning were verbal, written, or both. Company property: Whether it's a laptop you provided, a company car, or just a key card, chances are your employee has something that belongs to the company. Of course, in some cases of employee termination, certain property is given as a perk of employment. Make sure you note if you'll be asking for property back. Vacation time and final paycheck: If your employee has accrued vacation time, chances are you're required to pay them for what they've accrued. But laws vary and, if you're dealing with a contractor or part-time employee, you may not have to pay out for vacation or sick leave. What you will have to do is pay your employee what they're owed. Include what date they'll be paid through and how they'll receive their last paycheck: in person, by mail, or direct deposit. It's often smart to pay your employee then, so that when the Termination Letter is signed, employment is officially over. Health insurance, 401K, and other benefits: If you've provided benefits like health insurance or retirement savings, make sure your employee knows how this will be handled, and that it is outlined in the termination letter. Provide them with information about continuing their health insurance and when it runs out. Let them know where their savings are. Your work relationship may be over, but your employee still has a future. Giving them this information up front will make their transition much easier. Do Employers Have to Give a Reason for Employment Termination? Before terminating an employee, it is important that you review your employment agreement, employee handbook and any other HR policy to clearly understand your legal responsibilities as the employer—specifically whether or not you are obligated to terminate the employee with just cause, such as misconduct or poor performance. Termination at will vs. termination for cause: Unless state law or your employment contract say otherwise, employment is generally at-will, meaning that employees can quit or be terminated with or without a specific reason or any advance notice/compensation. If you have questions about your reasons for terminating an employee, talk to an attorney. 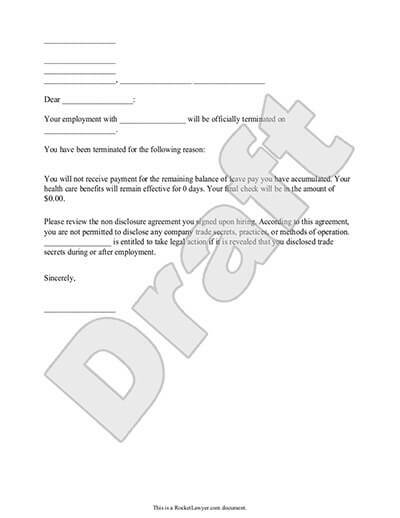 Are Employers Required to Provide a Notice of Termination (Termination Letter)? While many employment relationships are "at-will", there are some instances where a notice of termination may be required, including if the employee is covered by a union or collective bargaining agreement. If you are unsure about what requirements apply to your situation, ask a lawyer. Even if you are terminating an at-will employee, there are still precautions to be taken to avoid wrongful termination, that is, firing someone for an illegal reason. In addition to laying out the terms of employment in an Employment Contract, employers should also consider outlining your expectations in an Employee Handbook, documenting and enforcing your company's disciplinary policy, as well as maintaining proper records of disciplinary actions taken in the employee's HR file. If you have any questions about what's right for you and your business as it relates to termination law, we can connect you with a lawyer for quick answers or a review of your Letter of Termination. 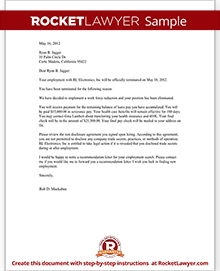 Our step-by-step interview process makes creating a printable Termination Letter easy.